A continuous process for producing water-insoluble, water-swellable polymers comprises subjecting a monomer and initiator to polymerization conditions in a reactor system having at least 3 zones. 본 발명은 초흡수성 중합체의 제조방법에 관한 것이다. The present invention relates to a process for the preparation of superabsorbent polymer. 초흡수성 중합체는 기저귀와 같은 신체 보호 제품에서 통상적으로 사용되는 널리 공지된 재료이다. The superabsorbent polymer is a well known material commonly used in personal care products such as diapers. 이들 중합체는, 예를 들면, 물, 염수, 뇨, 혈액 및 장액을 그의 중량의 몇 배로 흡수하는 것으로 공지되어 있다. These polymers are, for example, are known to absorb water, saline, urine, blood and intestinal fluids several times its weight. 진탕되거나 진탕되지 않은 배치식 또는 연속식 방법을 포함하는 초흡수성 중합체를 제조하는 몇가지 방법이 공지되어 있다. There are several methods for producing a superabsorbent polymer comprising a non-shaken or agitated batch or continuous methods known in the art. 예를 들면, 미국 특허 제4,857,610호에는 컨베이어 벨트 상에서 수용성 중합체를 중합시키는 진탕되지 않은 배치식 또는 연속식 방법이 기재되어 있다. For example, U.S. Patent No. 4.85761 million discloses a non-agitated batch or continuous method of polymerizing a water-soluble polymer on the conveyor belt is described. 일본 특허원 제57-34101호에는 다수의 회전 암(arm)을 갖는 반응기를 사용하는 배치식 중합방법이 기재되어 있다. Japanese Patent Application No. 57-34101 discloses a batch-wise polymerization process is described using a reactor having a plurality of rotary arm (arm). 유럽 특허공보 제0 303 440 B1호에는 다수의 회전 샤프트를 갖고 이들 각각의 회전 샤프트에 교반 블레이드가 장착되어 있는 반응 용기 속에서의 배치식 중합방법이 교시되어 있으나, 당해 문헌에는 이러한 중합방법이 연속식으로도 수행될 수 있다고 기재되어 있다. European Patent Publication No. 0 303 440 B1 discloses a plurality of having a rotating shaft, but teaches the batch-wise polymerization in a reaction vessel in which the mixing blades attached to the respective rotary shaft thereof, the art literature has such a polymerization process continuously It has been described that can be performed by the following formula. 일본 특허원 제56-32514호에는 반응물이 플러그 흐름 반응기에 도입됨에 따라 반응물을 혼합하기 위해 정적 혼합기를 사용한다. Japanese Patent Application No. 56-32514 discloses to use a static mixer to mix the reactants as the reaction product is introduced into a plug flow reactor. 미국 특허 제4,769,427호에는 단일 회전 샤프트를 갖는 용기 속에서의 연속식 중합방법이 교시되어 있다. U.S. Patent No. 4,769,427 discloses a continuous polymerization method is a in a container having a single rotating shaft teachings. 다수의 회전 샤프트를 갖는 용기 속에서의 연속식 중합방법은 미국 특허 제4,625,001호에 교시되어 있다. A plurality of rotary shaft continuous polymerization method in a container in which the can is taught in U.S. Patent No. 4,625,001. 이들 방법들은 모두 여러가지 단점 및 결함을 갖는다. These methods all have various disadvantages and defects. 따라서, 초흡수성 중합체를 제조하기 위한 개선된 연속식 방법이 요구된다. Thus, an improved continuous process for the manufacture of a superabsorbent polymer are required. 본 발명은 단량체를 3개 이상의 구역을 포함하는 반응기 시스템에서 연속 중합시키는 공정을 포함하는, 수분 흡수성 수 불용성 중합체를 제조하기 위한 개선된 방법으로서, 제1 구역이 단량체의 중합이 개시되도록 하는 조건하에 단량체, 개시제 및 물이 공급되는 개시 구역이고, 제2 구역이 겔 상 구역이며, 제3 구역이 과립화 구역이고, 반응기 시스템이 제2 구역과 제3 구역 각각에서 2개 이상의 회전 샤프트를 가지며, 제2 구역과 제3 구역에서의 피크 온도가 50 내지 100℃이고, 제1 구역에 공급된 물의 일부 또는 전부가 임의로 증기의 형태인, 수분 흡수성 수 불용성 중합체의 제조방법에 관한 것이다. As the improved method of this invention for the production of, water-absorbent water-insoluble polymer comprising a step of continuous polymerization in a reactor system comprising at least three zones of monomers, under conditions such that the first zone is initiated and the polymerization of the monomers is disclosed to be a monomer, an initiator and water feeding zone, the second zone is the zone gel, the third zone the granulation section, and the reactor system has a second zone and a least 2-3 zone each rotation shaft, a second zone and a with a peak temperature of 50 to 100 ℃ in the third section, a part or all of water supplied to the first zone optionally is in the form of steam, a method of producing water-absorbent water-insoluble polymer. 반응기 시스템의 제2 구역과 제3 구역의 압력은 대기압 미만이다. The second zone and the pressure in the third zone of the reactor system is less than atmospheric pressure. 도 1은 본 발명의 방법에서 사용되는 반응 용기의 바람직한 양태에서의 3개의 구역을 나타내는 모식도이다. 1 is a schematic diagram showing the three zones in the preferred embodiment of the reaction vessel used in the process of the present invention. 본 발명의 방법에서, 초흡수성 중합체는 3개 이상의 구역을 포함하는 반응기 시스템에서 연속적으로 제조된다. In the method of the present invention, the superabsorbent polymer is produced continuously in a reactor system comprising at least three zones. 제1 구역은 개시 구역이다. The first zone is an initiation zone. 제2 구역은 점성 겔 구역이고, 제3 구역은 과립화된 겔 구역이다. The second zone is a viscous gel zone, the third zone is a zone of the gel granulation. 임의로 중합을 마무리하고 건조 등의 추가의 처리를 하기 전에 중합체를 저장하는 제4 구역이 사용될 수 있다. Optionally finishing the polymerization, and there is a fourth zone may be used to store the polymer prior to further processing of the drying and the like. 본 발명의 바람직한 방법은 적합한 단량체를 공유 가교결합제 및 개시제의 존재하에 중합시키는 공정을 포함한다. A preferred method of the invention involves a step of polymerizing in the presence of a suitable share monomer cross-linking agent and initiator. 본 발명의 방법에 의해 적합하게 제조된 수팽윤성이거나 약하게 가교결합된 친수성 중합체는 다량의 유체를 흡수할 수 있는 공지된 친수성 중합체 중의 임의의 것일 수 있다. It can be suitably prepared by the method of the present invention water-swellable or lightly crosslinked hydrophilic polymer-bonded may be any of the known hydrophilic polymers capable of absorbing large quantities of fluids. 특히 바람직한 수분 흡수성 중합체는 카복실 잔기를 함유하는 수분 흡수성 중합체이다. A particularly preferred water-absorbing polymer is a water-absorbing polymer containing a carboxyl moiety. 바람직하게는, 흡수성 중합체 100g당 약 0.01당량 이상의 카복실 그룹이 존재한다. Preferably, the carboxyl group is present at least about 0.01 equivalents per 100g water absorbent polymer. 바람직한 카복실 함유 흡수성 중합체로는, 전분-아크릴산 또는 폴리비닐 알콜 그래프트 공중합체의 부분 중화 생성물, 아크릴아미드 공중합체의 가수분해물의 가교결합된 생성물, 폴리아크릴산의 부분 중화 생성물 및 부분 중화 폴리아크릴산의 가교결합된 생성물이 있다. The preferred carboxyl containing water absorbent polymers, starch-acrylic acid or polyvinyl alcohol graft copolymers partially neutralized product, acrylamide crosslinked product, a crosslinked polyacrylic acid partially neutralized product and the partially neutralized polyacrylic acid in the hydrolyzate of a copolymer of the copolymer there is a product. 적합한 α,β-에틸렌계 불포화 단량체는, 예를 들면, 아크릴산, 메타크릴산, 크로톤산, 이소크로톤산 및 알칼리 금속염 및 이의 암모늄 염; Suitable α, β- ethylenically unsaturated monomer, e.g., acrylic acid, methacrylic acid, crotonic acid, isocrotonic acid and alkali metal salts thereof and ammonium salts thereof; 이타콘산, 아크릴아미드, 메타크릴아미드 및 2-아크릴아미도-2-메틸-1-프로판 설폰산 및 이의 염을 포함한다. Itaconic acid, and acrylamide, methacrylamide and 2-acrylamido-2-methyl-1-propanesulfonic acid and salts thereof. 바람직한 단량체는 아크릴산 및 메타크릴산과 알칼리 금속염 또는 암모늄염과 같은 이들 각각의 염 형태를 포함한다. Preferred monomers include respective salt forms thereof, such as acrylic acid and methacrylic acid and alkali metal salt or ammonium salt. 바람직하게는, 단량체는 수용성이다. Preferably, the monomer is water-soluble. 수용성 단량체는, 단량체 수용액의 총 중량을 기준으로 하여, 10 내지 80중량% 범위의 양으로 수용액에서 사용될 수 있다. Water-soluble monomers, based on the total weight of the aqueous monomer solution, can be used in aqueous solution in an amount of 10 to 80% by weight. 바람직하게는, 단량체의 양은, 단량체 수용액의 총 중량을 기준으로 하여, 15 내지 60중량%의 범위이다. Preferably, the range of the amount of the monomer, based on the total weight of the aqueous monomer solution, 15 to 60% by weight. 임의로, 예를 들면, 메틸 아크릴레이트 또는 메틸 메타크릴레이트를 포함하는 산 단량체의 알킬 에스테르와 같은 기타 수용성 불포화 단량체가 흡수성 중합체에 미량 존재할 수 있다. Optionally, for example, other water-soluble unsaturated monomers such as alkyl esters of the acid monomers including methyl acrylate or methyl methacrylate be present in trace amounts in the water absorbent polymer. 또한, 예를 들면, 폴리비닐 알콜, 전분 및 수용성 또는 수 팽윤성 셀룰로스 에테르와 같은 특정한 그래프트 중합체가 생성물 제조에 사용될 수 있다. Also, for example, a polyvinyl alcohol, a specific graft polymer such as starch and a water-soluble or water-swellable cellulose ethers may be used to make product. 이러한 그래프팅 중합체가 사용되는 경우, 이들은, α,β-에틸렌계 불포화 단량체를 기준으로 하여, 약 10중량% 이하의 양으로 사용된다. In such grafted polymers they are used, which, on the basis of α, β- ethylenically unsaturated monomer, is used in an amount of up to about 10% by weight. 단량체 혼합물이 사용될 수 있다. The monomer mixture may be used. 중화되지 않거나 중합하기 전에 완전 또는 부분 중화 산 단량체를 사용하여 중합을 수행할 수 있다. It is possible to use a fully or partially neutralized acid monomer before the polymerization does not neutralize the polymerization. 수성 단량체 용액을, 산 단량체에 존재하는 산 그룹의 20 내지 95%를 중화시키기에 충분한 염기량과 접촉시킴으로써 편리하게 중화시킬 수 있다. By contacting the salt amount sufficient to neutralize from 20 to 95% of the acid groups present in the aqueous monomer solution, the acid monomers can be easily neutralized. 바람직하게는, 염기량은 산 단량체에 존재하는 산 그룹의 40 내지 85%, 가장 바람직하게는 55 내지 75%를 중화시키기에 충분할 것이다. Preferably, the salt amount is 40 to 85% of the acid groups present in the acid monomers will be sufficient to neutralize most preferably 55 to 75%. 단량체는 중화도가 50 내지 80몰%의 범위인 부분 중화 아크릴산을 25 내지 50중량% 포함한다. Monomers include the degree of neutralization of the partially neutralized acrylic acid in the range of 50 to 80 mol%, 25 to 50% by weight. 단량체의 산 그룹을 중화시키기에 유용한 적합한 화합물은 중합 공정에 유해한 효과를 갖지 않으면서 산 그룹을 충분히 중화시키는 염기를 포함한다. Useful compounds suitable for neutralizing the acid groups of the monomers comprises a base sufficiently neutralize the acid groups without having a detrimental effect on the polymerization process. 이러한 화합물의 예는 알칼리 금속 수산화물, 알칼리 금속 탄산염 및 알칼리 금속 중탄산염을 포함한다. Examples of such compounds include alkali metal hydroxides, alkali metal carbonates and alkali metal bicarbonates. 염기 혼합물이 사용될 수도 있다. The base mixture may also be used. 바람직하게는 수산화나트륨, 수산화칼륨, 탄산나트륨 및 탄산칼륨을 사용하여 단량체를 중화시킨다. Preferably neutralize the sodium hydroxide, potassium hydroxide, sodium carbonate, and monomers with potassium carbonate. 바람직한 중화도를 결정하는 데 있어서, 흡수될 수성 유체와 접촉하거나 이러한 유체 속에 분산될, 가교결합된 흡수성 중합체 생성물의 pH가 당해 중합체가 의도하는 용도에 적합한 범위를 유지하도록 주의를 기울여야 한다. In determining the desired degree of neutralization, care must be taken to maintain a suitable range in which the pH of the contact or bonding, crosslinking will be dispersed in such fluids with water-based fluid to be absorbed is water-absorbent polymer product, the polymer intended use. 또는, 당해 분야에 공지된 바와 같이, 중화되지 않은 단량체를 사용하여 중합을 수행한 다음 중화시킬 수도 있다. Alternatively, as is well known in the art, by using the unneutralized monomers the polymerization may be then neutralized. 통상적인 비닐 부가중합 개시제는 수용성 단량체 및 가교결합제의 중합시 유리하게 사용된다. Conventional vinyl addition polymerization initiator is advantageously used in polymerization of the water-soluble monomer and a cross-linking agent. 중합을 개시하기 위해 단량체 용액 속에서 충분히 용해되는 유리 라디칼 중합 개시제가 바람직하다. The free radical polymerization initiator which is sufficiently soluble in the monomer solution is preferred to initiate the polymerization. 예를 들면, 과황산칼륨, 과황산암모늄, 과황산나트륨 및 기타 알칼리 금속 과황산염과 같은 수용성 과황산염; For example, water soluble persulfates such as potassium persulfate, ammonium persulfate, sodium persulfate, and other alkali metal persulfates; 수산화나트륨; Sodium hydroxide; 및 2,2'-아조비스-(2-아미디노프로판)하이드로클로라이드와 같은 수용성 아조 화합물이 사용될 수 있다. And 2,2'-azobis- (2-amidinopropane) may be used water-soluble azo compounds, such as the hydrochloride. 과산화수소와 같은 이들 개시제 중의 일부는 아황산염, 아민 또는 아스코르브산과 같은 환원 물질과 혼합하여 공지된 산화환원형 개시제를 형성할 수 있다. Some of these initiators, such as hydrogen peroxide may form a redox initiator round known in combination with reducing substances such as sulfites, amines or ascorbic acid. 사용되는 개시제의 총량은, α,β-에틸렌계 불포화 단량체의 총 중량을 기준으로 하여, 0.01 내지 1.0중량%, 바람직하게는 0.01 내지 0.5중량%의 범위일 수 있다. The total amount of initiator to be used may be, α, β- ethylenically based on the total weight of the unsaturated monomer, 0.01 to 1.0% by weight, preferably from 0.01 to a range of 0.5% by weight. 과황산염은 제3 구역, 방출 스트림 또는 이들 둘 다에 도입된다. Persulfate is introduced to the third zone, the stream discharge or both. 흡수성 중합체는 바람직하게는 약하게 공유결합되어 수 불용성 및 수 팽윤성이 된다. Absorbent polymer is preferably a water-insoluble and water swellable is coupled weakly shared. 바람직한 가교결합된 구조는 소정의 수용성 단량체를 분자 단위 내에 2개 이상의 중합성 이중결합을 갖는 가교결합제와 공중합시켜 수득할 수 있다. Preferred crosslinked structure may be obtained by copolymerization with a crosslinking agent having two or more polymerizable double bonds in the molecule a desired water-soluble monomeric units. 가교결합제는 수용성 중합체를 공유결합하기에 효과적인 양으로 사용된다. Cross-linking agent is used in an amount effective to covalently bonded to a water soluble polymer. 가교결합제의 바람직한 양은 바람직한 흡수 용량 및 흡수된 유체를 보유하기 위한 바람직한 강도, 즉 바람직한 하중하 흡수도(AUL)에 의해 결정된다. Desired strength to hold the desired amount of absorbent capacity desired, and the absorbing fluid of the cross-linking agent, that is preferred is determined by the weight and the absorbency (AUL). 가교결합제는, 사용된 α,β-에틸렌계 불포화 단량체 100중량부를 기준으로 하여, 0.0005 내지 5중량부 범위의 양으로 사용되는 것이 유리하다. Crosslinking agent, to be the α, β- reference to the ethylenically unsaturated monomer of 100 parts by weight used, used in an amount ranging from 0.0005 to 5 parts by weight, is advantageous. 보다 바람직하게는 당해 양은, α,β-에틸렌계 불포화 단량체 100중량부를 기준으로 하여, 0.1 내지 1중량부이다. More preferably the art the amount, α, β- ethylenically unsaturated monomer based on the total 100 parts by weight, 0.1 to 1 part by weight. 통상적으로, 단량체 100부당 가교결합제 약 5중량부의 양이 사용되는 경우, 생성된 중합체는 가교결합 밀도가 너무 높거나 흡수 용량이 감소되거나 AUL이 증가될 것이다. Typically, if the amount of monomer per 100 parts of the crosslinking agent from about 5 weight parts are used, the resulting polymer has a too high cross-linking density or absorption capacity is reduced or will increase the AUL. 가교결합체가 단량체 100중량부당 0.0005중량부 미만의 양으로 사용되는 경우, 중합체는 통상 가교결합 밀도가 너무 낮고, 흡수될 유체와 접촉하는 경우 점착성이 되며, 초기 흡수율이 낮아질 것이다. If the crosslinked product is used in an amount of monomer is less than 0.0005 part by weight per 100 parts by weight of the polymer is typically cross-linked density is too low, and the adhesion when in contact with the fluid to be absorbed, to lower the initial water absorption. 공유결합제가 바람직하게는 α,β-에틸렌계 불포화 단량체의 수용액에 가용 성인 반면, 가교결합제는 이러한 용액 속에서 단순히 분산성일 수 있다. On the other hand shared binder preferably α, β- soluble in an aqueous solution of the ethylenically unsaturated monomers adult, the crosslinking agent may be merely dispersed in such a solution, holy days. 적합한 분산제의 용도는 본원에 참조로 인용되는 미국 특허 제4,833,222호에 기재되어 있다. The use of suitable dispersing agents are described in U.S. Patent No. 4,833,222, which is incorporated herein by reference. 적합한 분산제의 예는 카복시메틸 셀룰로스 현탁 조제, 메틸 셀룰로스, 하이드록시프로필 셀룰로스 및 폴리비닐 알콜을 포함한다. Examples of suitable dispersing agents include carboxymethyl cellulose suspending aids, methyl cellulose, hydroxypropyl cellulose and polyvinyl alcohol. 이러한 분산제는, α,β-에틸렌계 불포화 단량체의 총 중량을 기준으로 하여, 0.005 내지 0.1중량%의 농도로 제공되는 것이 유리하다. Such dispersants are, to be in α, β-, based on the total weight of the ethylenically unsaturated monomer, provided at a concentration of 0.005 to 0.1% by weight is advantageous. 적합한 공유 가교결합제는 한 분자 내에 CH 2 =CHCO-, CH 2 =C(CH 3 )CO- 및 CH 2 =CH-CH 2 -로 이루어진 그룹으로부터 선택된 2 내지 4개의 그룹을 갖는 화합물을 포함한다. Suitable cross-linking agents are shared CH 2 = CHCO-, CH 2 = C (CH 3) CO- , and CH 2 = CH-CH 2 in one molecule include compounds having from 2 to 4 groups selected from the group consisting of. 예시되는 공유 가교결합제는, 디알릴아민; Shared crosslinking agent is exemplified, diallylamine; 트리알릴아민; Triallylamine; 에틸렌 글리콜, 디에틸렌 글리콜, 트리에틸렌 글리콜, 프로필렌 글리콜, 1,4-부탄디올, 1,5-펜탄디올, 1,6-헥산디올, 네오펜틸 글리콜, 트리메틸올프로판 및 펜타에리트리톨의 디아크릴레이트 및 디메타크릴레이트; Diacrylates of ethylene glycol, diethylene glycol, triethylene glycol, propylene glycol, 1,4-butanediol, 1,5-pentanediol, 1,6-hexanediol, neopentyl glycol, trimethylolpropane and pentaerythritol, and dimethacrylate; 트리메틸올프로판 및 펜타에리트리톨의 트리아크릴레이트 및 트리메타크릴레이트; Trimethylolpropane and pentaerythritol triacrylate and the trimethacrylate; 펜타에리트리톨의 테트라-아크릴레이트 및 테트라메타크릴레이트; A solution of pentaerythritol-tetra-acrylate and methacrylate; 알릴 메타크릴레이트; Allyl methacrylate; 테트라알릴옥시에탄; Tetra-allyloxy-ethane; 및 트리메틸올프로판, 펜타에리트리톨, 펜타에리트리톨의 테트라-아크릴레이트, 펜타에리트리톨의 테트라메타크릴레이트 및 알릴 메타크릴레이트의 고도로 에톡실화된 유도체(예: 고도로 에톡실화된 트리메틸올 프로판 트리아크릴레이트)를 포함한다. And trimethylolpropane, pentaerythritol, pentaerythritol of tetra-tetra-acrylate, pentaerythritol methacrylate, and allyl methacrylate highly ethoxylated the acylated derivative (e.g., of: highly ethoxylated trimethylolpropane triacrylate ) a. 공유 가교결합제의 혼합물이 사용될 수 있다. Mixtures of crosslinking agents can be used to share. 본 발명의 실시에 유용한 중합체를 제조하기 위한 바람직한 양태에서, 부분 중화 형태의 α,β-에틸렌계 불포화 단량체의 수용액, 공유 가교결합제, 개시제 및, 경우에 따라, 그래프팅 중합체 기재를 준비한다. In accordance with the preferred embodiment for the production of polymers useful in the practice of this invention, an aqueous solution of the partially neutralized form of the α, β- ethylenically unsaturated monomer, cross-linking agents share, initiator and, if, prepares a grafting polymer substrate. 당해 혼합물의 중합은 개시제를 함유하는 혼합물의 온도를 상승시키거나 상술한 바와 같은 산화환원형 개시제를 사용하여 개시할 수 있다. Polymerization of the mixture can be initiated using a redox initiator such as a circle as to raise the temperature of the mixture containing the initiator or above. 연속식 작동시 개시 온도는 후술되는 바와 같이 제1 구역에서의 온도일 것이다. Starting temperature during the continuous operation will be the temperature in the first zone, as will be described later. 중합이 수행되는 온도는, 당해 분야의 숙련가에게 이해되는 바와 같이, 사용되는 단량체의 유형과 사용되는 특정한 개시제 시스템에 따라 크게 좌우된다. The temperature at which the polymerization is carried out, it is, depends to a great extent on the particular initiator system used and the type of monomer used, as will be appreciated to those skilled in the art. 바람직하게는 최대 중합 온도는 50 내지 100℃, 가장 바람직하게는 60 내지 85℃이다. Preferably the maximum polymerization temperature is 50 to 100 ℃, most preferably from 60 to 85 ℃. 본 발명의 바람직한 양태에서, 하나 이상의 단량체, 물 및 하나 이상의 개시제를 포함하는 공급 혼합물을 반응기 시스템의 제1 구역에 연속적으로 공급한다. In a preferred embodiment of the invention, the continuously fed into a feed mixture comprising one or more monomers, water and at least one initiator in a first zone of the reactor system. 경우에 따라, 공급 혼합물의 온도는 주변 온도보다 높을 수 있다. If desired, the temperature of the feed mixture may be higher than the environmental temperature. 바람직하게는, 공급 혼합물의 온도는 10 내지 40℃, 보다 바람직하게는 20 내지 35℃이다. Preferably, the temperature of the feed mixture is preferably from 20 to 35 ℃ than 10 to 40 ℃,. 공급 혼합물은 바람직하게는 액상이다. The feed mixture is preferably a liquid. 제1 구역에 대한 공급 속도는 시간당 반응기 용적 1ℓ당 0.5 내지 5kg, 바람직하게는 1.3 내지 3.3kg이다. The feed rate for the first zone is from 0.5 to 5kg, preferably from 1.3 to 3.3kg per 1ℓ per reactor volume. 반응 시스템의 제1 구역은 개시 구역이다. The first zone of the reaction system is initiated zone. 이러한 구역은 비교적 점성인 1개의 액체 상을 함유하거나, 바람직하게는 액체 공급 스트림과 부분적으로 중합된 중합체 고체로 이루어진 비교적 점성이 낮은 2상 혼합물을 함유한다. This zone shall contain a point relatively adult one liquid phase or, preferably, containing a relatively low viscosity, the two-phase mixture consisting of a liquid feed stream with a partially polymerized polymer solids. 이러한 2상 혼합물은 점성 상에 비해 고도로 혼합되고 당해 구역에 적용되는 임의의 온도 조절 수단의 효율을 용이하게 개선시킬 수 있다는 점에서 유리하다. This two-phase mixture was highly viscous mixture than on is advantageous in that it is possible to easily improve the efficiency of any of the temperature adjusting means applicable to the art section. 2개의 상이 존재하는 상황에서, 새로운 단량체는 제1 구역에서 부분적으로 중합된 물질로 용이하게 혼합된다. In situations where two phases exist, new monomers are mixed to facilitate a partially polymerized material in the first zone. 제1 구역에서 고도의 혼합이 달성되므로, 당해 구역에서 반응 매스 내부의 우수한 열 교환이 관찰된다. Since the mixing of the height achieved in the first zone, the good thermal exchange of the reaction mass is observed at that zone. 유리하게는, 제1 구역에 대한 공급물에서 단량체 농도는, 제1 구역에 대한 공급물의 중량을 기준으로 하여, 35중량% 이상, 바람직하게는 40중량% 이상, 보다 바람직하게는 45중량% 이상이다. Advantageously, the monomer concentration in the feed to the first zone, on the basis of the supply of water by weight of the first zone, 35% by weight or more, preferably 40 wt% or more, more preferably 45% or more to be. 제1 구역에서의 온도는 바람직하게는 30 내지 100℃이다. Temperature in the first zone is preferably from 30 to 100 ℃. 보다 바람직하게는, 제1 구역의 온도는 40 내지 85℃이다. More preferably, the temperature of the first zone is from 40 to 85 ℃. 본 발명의 한 양태에서, 증기를 물 공급원으로서 뿐만 아니라 열 공급원으로서 제1 구역에 공급한다. In one aspect of the invention, the supply of steam as a source of water as well as a source of heat in the first zone. 바람직하게는, 제1 구역에 대한 물 공급물의 0.5 내지 5중량%가 증기의 형태이다. Preferably, a 0.5 to 5% by weight water, the water supply to the first region in the form of steam. 당해 구역 중의 전환율은 약 40%까지일 수 있다. Conversion zone in the art can be up to about 40%. 바람직하게는, 제1 구역에서의 전환율은 10 내지 40%이다. Preferably, the conversion in the first zone is from 10 to 40%. 제1 구역에서의 체류 시간은 전체 반응 구역에서의 총 체류 시간의 20 내지 50%이다. The residence time in the first zone is from 20 to 50% of the total residence time in the whole reaction zone. 제1 구역으로의 총 에너지 유입량의 50 내지 90%는 중합 반응 열에 의해 공급되고, 10 내지 40%는 주입된 증기에 의해 공급되며, 0 내지 15%는 반응용기벽을 가열시킴으로써 공급된다. 50 to 90% of the total energy input in the first zone is supplied by heat polymerization, 10 to 40% is supplied by the injected steam, 0 to 15% is supplied by heating the reaction vessel wall. 제1 구역에서 비교적 이유동성인 물질과 대조적으로, 제2 구역에서의 물질은 고도의 점성 겔이다. In the first zone with a relatively Same reason the material in contrast, the material in the second zone is a highly viscous gel. 제2 구역에서의 높은 점도의 견지에서, 당해 구역을 통과하는 물질은 대체로 플러그 유동 방식으로 통과한다. In light of the high viscosity in the second zone, the material passing through the zone art is generally passed through a plug flow manner. 제2 구역의 말단에서 단량체의 중합체로의 전환율은 바람직하게는 50 내지 75%이다. Conversion of the monomers at the end of the second section the polymer is preferably from 50 to 75%. 일반적으로 말하자면, 제2 구역에서의 겔 물질은 당해 구역을 통과함에 따라 점차 온도가 증가한다. Generally speaking, the gel material in the second zone increases the temperature gradually as it passes through the zone the art. 제2 구역에서의 온도는 바람직하게는 50 내지 85℃이다. Temperature in the second zone is preferably from 50 to 85 ℃. 당해 구역에서의 중합체의 체류 시간은 모든 반응 구역에서 총 체류 시간의 20 내지 50%이다. The residence time of the polymer at that zone is 20 to 50% of the total residence time in all reaction zones. 제3 구역의 기능은 겔 매스를 이유동성 과립화 물질로 전환시키는 것이다. Features of the third zone is to switch the gel because mass Province granulated material. 제2 구역에서부터 제3 구역까지, 반응기 시스템 중의 중합체는 고점성 겔로부터 비교적 이유동성인 과립화 겔로 변화한다. First and second zone from the third zone to change, the gel polymer granules in the reactor system has a relatively high viscosity gel reason Bi from Tuesday. 당해 방법의 이 단계에서, 중합 반응은 거의 완료되며, 전환율은 바람직하게는 중합체가 반응기에서 방출될 때까지 90% 이상이고, 99.9% 이하일 수 있다. In this step of the method, the polymerization reaction is substantially complete, the conversion rate is preferably 90% or until the polymer is discharged from the reactor and may be up to 99.9%. 이 구역에서의 온도는 비교적 안정하다. The temperature in the area is relatively stable. 이 구역에서 중합체의 체류 시간은 모든 반응 구역에서 물질의 총 체류 시간의 10 내지 60%이다. The residence time of polymer in this zone is from 10 to 60% of the total residence time of the material in all the reaction zones. 당해 분야의 숙련가들은, 총 체류 시간이 체류 시간의 100%를 초과하지 않을 수 있음을 이해할 것이다. Those skilled in the art will appreciate that the total residence time may not exceed 100% of the residence time. 제3 구역에서의 평균 체류 시간의 합은 4 내지 80분, 바람직하게는 7 내지 20분이다. The third zone is the sum of the average residence time of 4 to 80 minutes, preferably 7 to 20 minutes. 바람직하게는, 적어도 2개 또는 3개의 구역이 진공하에 작동된다. Preferably, at least two or three zones operating under vacuum. 작동 압력은 바람직하게는 100 내지 800mbar, 보다 바람직하게는 200 내지 600mbar이다. The operating pressure is preferably 100 to 800mbar, more preferably 200 to 600mbar. 그러나, 이는 또한, 제1 구역에서의 액체가 비등하지 않도록 하는 범위의 작동 압력이 바람직하다. However, this also, the operating pressure in the range that does not prevent the liquid from boiling in the first zone is preferred. 진공하의 작동과 관련된 이점 중에서, 포지티브 압력에 비해 작동 온도를 낮춰서 추출물 함량을 낮추고 흡수 특성을 개선시키는 점이 있다. From the advantages associated with operating under vacuum, the point of improving the absorbing properties lower the extract content by lowering the operating temperature compared to the positive pressure. 또한, 진공 라인에 함유된 임의의 물이 응축되어 제3 구역으로 회수하는 것이 바람직하다. Also, any water contained in the vacuum line is condensed is preferably recovered in the third zone. 제3 구역으로 회수된 응축물은 제3 구역에서 중합체 겔의 유동성을 개선시킨다. The condensate recovered in three zones to improve the flowability of the polymer gel in the third zone. 본원에 기재된 바와 같은 각종 첨가제가 제2 구역 또는 제3 구역이나, 경우에 따라, 이들 두 구역 모두에서 반응기 시스템에 첨가될 수 있다. The various kinds of additives as described herein according to the second zone or the third zone and, in the case, these can be in both areas is added to the reactor system. 본 발명의 방법의 주요 이점 중의 하나는, 3개의 반응 구역을 형성하여, 각각의 구역에서 반응에 대한 가장 적합한 온도에 따라 3개의 구역 각각의 개별적인 온도 조절을 하는 것이다. One of the main advantages of the method of the invention, to form a three reaction zone, to the three zones each individual temperature control according to the most suitable temperature for the reaction in each zone. 공급물 스트림의 온도와 공급물의 단량체 농도와 같은 기타 온도 조절 수단 중에서, 가장 적합한 수단은 재킷 및 샤프트 가열 또는 냉각, 반응 매스로의 증기 주입 및 감압하의 증발 냉각이다. Among other temperature control means, such as temperature and feed monomer concentration of the feed stream, and the most suitable means of heating or cooling jacket and the shaft, and steam injection under reduced pressure evaporative cooling to the reaction mass. 반응기의 크기에 따라, 관련 세그먼트의 재킷 및 샤프트를 통한 온도 조절은 특히 실험용 및 소규모 반응기용으로 충분할 수 있다. Depending on the size of the reactor, the temperature control over the jacket and the shaft of the associated segment may be sufficient, particularly laboratory and small reaction copiers. 그러나, 상업용 규모의 반응기의 경우, 열 교환기 표면은 너무 작아서 열교환이 충분하지 않을 수 있다. However, in the case of commercial scale reactors, the heat exchanger surface is too small, heat may not be enough. 이 경우, 증기 주입 및 증발 냉각은 재킷 가열 및/또는 냉각과 조합하여 점성 구역에서 온도 조절이 충분히 이루어지도록 할 것이다. In this case, the vapor injection and evaporative cooling will be such that the jacket heating and / or cooling in combination with sufficient temperature control conducted in the viscous zone. 본 발명의 한 양태에서, 반응기 시스템의 세 구역은 모두 하나의 반응 용기에 내장된다. In one aspect of the invention, the three zones of the reactor system are all incorporated in one reaction vessel. 예를 들면, 중합은 리스트 아게(List AG)에서 입수할 수 있는 ORP 모델 반응기에서 수행될 수 있다. For example, the polymerization can be carried out in a reactor ORP model that can be obtained from List AG (List AG). 본 발명의 또 다른 양태에서, 제1 구역은 한 용기에 내장되고, 제2 구역 및 제3 구역은 별도의 용기에 내장된다. In another aspect of the invention, the first region is embedded in the vessel, the second zone and the third zone is embedded in a separate vessel. 각각의 양태는 다른 양태에 비교하여 이점을 갖는다. Each embodiment has the advantage, compared to other embodiments. 적어도 제2 구역 및 제3 구역에 대한 바람직한 반응기 용기는, 적어도 부분적으로 용기 축을 따라 용기 내용물을 운반하는 기능을 하는 2개의 스크류 또는 혼련 암(arm)을 함유하는 용기이다. A preferred reactor vessel for at least a second zone and the third zone is a vessel containing the two screws or kneading arm (arm) to the ability to at least partially carries the vessel contents along the container axis. 바람직한 양태에서, 암의 하나는 혼련용 암으로서 작동하고, 다른 암은 세정용 암으로서 작동한다. In a preferred embodiment, the one arm is to operate as an arm kneading, the other arm will work as a cancer for cleaning. 2개의 암의 회전 속도는 상이한 것이 바람직하지만, 이러한 회전 속도가 양쪽 암이 모두 동일할 수도 있다. The rotational speed of the two arms are different it is desirable, but this rotational speed may be the same both sides cancer. 바람직하게는, 이들 암은 반대 방향으로 회전하며, 암의 반경은 중복된다. Preferably, these arms are rotated in the opposite direction, the radius of the arm is duplicated. 바람직한 양태에서, 2개의 암은 서로에 대해 거의 또는 완전히 평행하다. In a preferred embodiment, the two arms is substantially or completely parallel to each other. 그러나, 2개 이상의 암을 갖는 용기, 동일한 방향으로 회전하는 암을 갖는 용기, 암의 반경이 중복되지 않는 용기, 암이 거의 또는 완전히 평행하지 않는 용기 또는 이들의 임의의 조합물을 사용할 수도 있다. However, it is also possible to use the container, the container, the container is the radius of the arm that does not overlap the cancer is little or vessel, or any combination thereof that does not completely parallel with the arm to rotate in the same direction having at least two arms. 임의로, 용기의 내부 표면은, 예를 들면, 용기 벽에 대해 반응기 내용물이 점착하는 정도를 감소시키려는 목적으로, 예를 들면, 폴리테트라플루오로에틸렌으로 피복시킬 수 있다. Optionally, the inner surface of the container, for example, in order to reduce the extent to which the reactor contents were pressure-sensitive adhesive on a container wall, for example, may be coated with polytetrafluoroethylene. 바람직한 양태에서, 추가의 열교환 용량을 제공하기 위해 용기의 샤프트를 냉각시킨다. In a preferred embodiment, to cool the shaft of the vessel to provide additional heat capacity. 제3 구역은 하나의 반응용기에 함유된다. The third zone is contained in a reaction vessel. 적어도 제2 구역 및 제3 구역은 하나의 반응용기에 함유된다. At least a second zone and the third zone is contained in a reaction vessel. 통상, 생성된 중합체는 미리 절단하여, 당해 분야에 널리 공지된 수단을 사용하여 건조시킨다. Typically, the resulting polymer is to pre-cut, and dried using means well known in the art. 적합한 건조 수단은 유동 상 건조기, 회전식 건조기, 가압 공기 오븐 및 순환식 밴드 건조기를 포함한다. Suitable drying means include fluidized bed dryers, rotary dryers, forced air ovens and circulation band dryer. 어떤 경우에는, 2개 이상의 단계, 즉 다단계로 건조시킨다. In some cases, the drying in two or more steps, that is multi-step. 건조 공정을 종결시킨 후, 중합체를 추가로 절단하여, 바람직하게는 평균 직경이 2mm 미만, 보다 바람직하게는 1mm 미만인 입자를 형성시킨다. After completion of the drying step, by cutting an additional polymer, thereby preferably forming the particles it is less than 1mm and more preferably an average diameter of less than 2mm,. 바람직하게는, 최종 중합체 생성물의 평균 입자 크기는 160㎛ 이상, 보다 바람직하게는 200㎛ 이상이다. Preferably, the average particle size of the final polymer product is at least 160㎛, more preferably at least 200㎛. 반응기로부터 방출되는 중합체의 중량 평균 입자 크기는 0.2 내지 50mm이다. The weight average particle size of the polymer exiting the reactor is from 0.2 to 50mm. 필요한 경우, 건조된 입자는 제WO 93/05080호 및/또는 미국 특허 제5,629,377호에 제시된 과정에 따라 열처리될 수 있으며, 이러한 문헌의 교시는 본원에 참조로 인용되어 있다. If necessary, the dried particles may be heat treated according to the procedure set out in WO 93/05080 the call and / or U.S. Patent No. 5,629,377, the teachings of these documents are incorporated herein by reference. 이러한 열처리는 바람직하게는 170℃ 이상, 보다 바람직하게는 180℃ 이상, 가장 바람직하게는 190℃ 이상의 온도에서 수행된다. This heat treatment is preferably carried out at a temperature above 170 ℃, more preferably at least 180 ℃, most preferably at least 190 ℃. 이러한 열처리는 바람직하게는 250℃ 미만, 보다 바람직하게는 240℃ 미만의 온도에서 수행된다. This heat treatment is preferably carried out at less than 250 ℃, more preferably at a temperature of less than 240 ℃. 열처리 방법은 중요하지 않다. Heat treatment is not critical. 예를 들면, 가압된 공기 오븐, 유동 상 가열기 및 가열된 스크류 컨베이어가 성공적으로 사용될 수 있다. For example, it forced air ovens, fluidized bed heaters, and heated screw conveyors may be used successfully. 필요한 경우, 가열된 중합체는 취급이 용이하도록 재습윤될 수 있다. If desired, the heated polymer may be re-wetted to facilitate handling. 중합체 입자의 흡수 특성을 개선시키는 한 가지 방법으로, 중합체 입자를 표면 가교결합시킬 수 있다. One way to improve the absorption properties of the polymer particles, it is possible to combine crosslinked polymer particle surface. 표면 가교결합 과정은 당해 분야에 널리 공지되어 있으며, 예를 들면, 미국 특허 제4,734,478호 및 제4,666,983호에 기재되어 있다. Surface cross-linking process is well known in the art and, for example, is described in U.S. Patent No. 4,734,478 and No. 4,666,983 arc. 이러한 과정은 중합체 입자의 하중하에 모듈러스 및/또는 흡수성을 증가시킬 수 있다. This process can increase the modulus and / or the absorbent under load of the polymer particles. 본 발명에 의해 제조된 중합체는, 예를 들면, 점착방지제 및 저분진 첨가제와 같은 공지된 첨가제를 임의로 포함할 수 있다. The polymers produced by the present invention are, for example, may include known additives such as an adhesive agent and a low dust additive arbitrarily. 본 발명의 한 양태에서, 중합체 미립자를 제1 구역에 도입시켜서 재순환시킨다. In one aspect of the invention, it is recycled by introducing the polymer particles in the first zone. 중합체 미립자의 재순환은 당해 분야에 공지되어 있다. Recycling of the fine polymer particles are known in the art. 예를 들면, 미국 특허 제5,342,899호를 참고한다. For example, refer to U.S. Patent No. 5,342,899. 초흡수성 중합체는 박형 및 초박형 1회용 기저귀를 포함하는 1회용 기저귀, 생리대, 실금 의류 및 붕대와 같은 흡습성 제품의 제조시 유용하다. The superabsorbent polymer is also useful in the manufacture of absorbent products such as disposable diapers, sanitary napkins, incontinence garments and bandages comprising a thin and ultra thin disposable diapers. 흡수성 제품은 초흡수성 중합체 5 내지 95중량%를 포함할 수 있다. The absorbent article may comprise the superabsorbent polymer 5 to 95% by weight. 전형적인 흡수성 제품에서, 초흡수성 중합체는 섬유 매트릭스에 분산될 수 있고, 이러한 제품에서 초흡수제는 유리하게는 제품의 중량을 기준으로 하여 30 내지 70중량%의 양으로 존재하고, 섬유 매트릭스는 제품의 중량을 기준으로 하여 70 내지 30중량%의 양으로 존재한다. In a typical absorbent article, the superabsorbent polymer can be dispersed in a fiber matrix, in these products, the superabsorbent is present in an amount of 30 to 70% by weight based on the weight of the the product glass fiber matrix weight of the product, on the basis of present in an amount of 70 to 30% by weight. 흡수성 제품의 또 다른 형태에서, 초흡수제는 초흡수성 중합체가 30 내지 95중량%의 양으로 존재하는 봉쇄 구조에 존재할 수 있다. In another form of absorbent article, the superabsorbent may be present in a containment structure in which the superabsorbent polymer is present in an amount of 30 to 95% by weight. 분산된 초흡수성 중합체와 내장된 초흡수성 중합체의 조합 또한 공지되어 있다. The combination of internal and dispersed superabsorbent polymer The superabsorbent polymer are also known. 다음 실시예 및 비교 실시예는 본 발명을 설명하기 위해 제시된 것이며, 결코 이의 범주를 제한하는 것으로 이해되어서는 안된다. The following embodiment examples and comparative examples are presented to illustrate the present invention, the means should not be construed as limiting the scope thereof. 모든 부 및 %는 별도의 언급이 없는 한 중량 기준이다. All parts and percentages are by weight unless otherwise stated. 흡수 용량(AC)은 문헌에 기재된 방법에 따라 측정한다[참고: Buchholz, FL and Graham, AT, "Modern Superabsorbent Polymer Technology," John Wiley & Sons(1998), page 153]. Absorbent capacity (AC) is measured according to the method described in the literature [see: Buchholz, FL and Graham, AT, "Modern Superabsorbent Polymer Technology," John Wiley & Sons (1998), page 153]. 3가지 상이한 조성물이 사용된다. Three different compositions are used. 약어 "boAA"는 "아크릴산을 기본으로 하는"을 나타내며, 이는 아크릴산이 중화되기 전의 중량을 지칭한다. Abbreviation "boAA" denotes a "to the acrylic acid as the default", which refers to the weight of the acrylic acid prior to neutralization. 조성물에서 사용되는 용어 "고형분"은 물이 아닌 조성물의 성분들을 지칭한다. The term "solid" used in the composition refers to the component of the non-water composition. 따라서, 고형분이 45%인 조성물 1A는 수분 함량이 55%이다. Accordingly, the composition of solid content of 45% 1A is a water content of 55%. PEG는 폴리에틸렌 글리콜을 나타낸다. PEG represents a polyethylene glycol. HE-TMPTA는 고도로 에톡실화된 트리메틸올프로판 트리아크릴레이트를 나타낸다. HE-TMPTA denotes a highly ethoxylated trimethylolpropane triacrylate. VERSENEX 80은 디에틸렌트리아민펜타아세트산의 오나트륨염의 수용액이고, 더 다우 케미칼 캄파니(The Dow Chemical Company)로부터 수득된다. VERSENEX 80 is di-sodium salt of an ethylene tree o aqueous solution of pentaacetic acid, are obtained from The Dow Chemical Company (The Dow Chemical Company). 약어 "nm"은 "측정되지 않음"을 나타낸다. Abbreviation "nm" indicates a "not measured". 모든 시험에서, List ORP 25(총 용적 30.6ℓ) 반응기를 사용하였다. In all tests, we used a List ORP 25 (total volume 30.6ℓ) reactor. 일반적으로, 반응기는 3개의 세그먼트를 갖는 원통형 용기이고, 이들 각각의 세그멘트는 자체내에 재킷이 구비되어 있다. In general, the reactor is a cylindrical vessel having three segments, each segment thereof is provided with a jacket within itself. 교반기 시스템 내의 온도와 3개의 재킷 각각은 개별적으로 조절될 수 있다. Each temperature and three jacket in a stirrer system can be adjusted individually. 방출 세그먼트는 말단에 수직 채널을 갖고 있으며, 이러한 수직 채널을 통해 중합체 생성물이 당해 채널에 부착된 생성물 컨테이너로 낙하될 수 있다. Release segment has a vertical channel to the terminal, and there is such a vertical channel through the polymer product can be dropped into the container attached to the product channel art. 필요한 경우, 방출 이중 스크류가 수직 채널 내에 삽입되어 강제적으로 생성물을 방출시킬 수 있다. If necessary, release double screw is inserted into the vertical channel may be forced to release the product. 대기압에서 수행되는 중합 실험의 경우, 투웨이 밸브가 반응기 배출구에 설치되었다. For the polymerization experiment carried out at atmospheric pressure, the two-way valve was installed at the reactor outlet. 밸브의 한 배출구를 연속적으로 방출되는 생성물을 수집하는 생성물 컨테이너에 연결하고, 다른 밸브 배출구를 질소 퍼징되고 원 말단에서 가열 밀봉된 플라스틱 호스에 연결하였다. Connected to the product container to collect the product exiting the outlet of the valve continuously, and was connected to the heat seal plastic hose the other valve outlets and nitrogen purge in the source terminal. 당해 플라스틱 호스는 샘플이 산소가 배제된 상태하에서 작동되는 동안 샘플을 취하도록 하였다. Art plastic tubing was to take a sample for which a sample is operated under oxygen-excluding conditions. 반응기에는 13.5kW 드라이브를 장착하였다. Reactor was fitted with a 13.5kW drive. 진공하에 수행되는 중합 실험의 경우, 선형 배출구 라인을 생성물 컨테이너의 진공 밀봉을 위해 설치하였다. For the polymerization experiment carried out under vacuum to provided for the vacuum sealing of the container, the linear product outlet line. 이러한 라인은 생성물 컨테이너가 반응기에서 목적하는 진공을 유지하면서 교환될 수 있도록 하는 방식으로 배관 및 밸브가 설치되었다. This line is a pipe and a valve was installed in such a way that can be exchanged without breaking vacuum in the reactor to the desired container product. 당해 장치는 또한 컨테이너가 반응기에 대해 개방되기 전에 이로부터 산소를 제거하고 배기시키는 시스템을 포함하였다. The apparatus was also therefrom before the container is opened for the reactor comprises a system for removing oxygen, and exhaust. 각각의 세그먼트에는 열전쌍이 장착되어 각각의 세그먼트 내의 고체 또는 고체/액체 물질의 온도(첫번째 세그먼트의 경우 T1, 중간 세그먼트의 경우 T2 및 방출 세그먼트의 경우 T3)를 측정하였다. Each segment is equipped with a thermocouple to measure the temperature of a solid or solid / liquid material in each of the segments (in the case of the first segment for T1, T2 and the intermediate segments for release segment T3). 열전쌍은 또한 각각의 세그먼트의 유입구 및 배출구의 열 교환 유체(물)의 온도를 측정하는 위치에 있었다. Thermocouples were also in a position to measure the temperature of the heat exchange fluid (water) in the inlet and outlet of each segment. 공급물 말단의 플랜지와 반응기의 방출 말단에 연결된 배기 시스템이 반응기가 질소 퍼징되도록 하였다. The exhaust system is connected to the discharge end of the flange and the reactor feed was terminated so that the reactor is purged with nitrogen. 배기 라인에서의 응축기를 반응기 상부에 고정하고 배기 라인의 수증기를 응축시키며, 응축물을 반응기의 제3 구역으로 환류시켰다. Holding the condenser at the exhaust line to the reactor upper portion and sikimyeo condensing the water vapor in the exhaust line, and the mixture was refluxed condensate in the third zone of the reactor. 연동 펌프가 단량체 혼합물과 개시제를 반응기의 공급물 말단에 연속적으로 공급하였다. The peristaltic pump was continuously fed into the monomer mixture and initiator to the feed end of the reactor. 주요 개시제(과황산나트륨)를 단량체 공급 라인에 직접 주입하고, 인라인 혼합기 속에서 이를 혼합하였다. The major initiator (sodium persulfate) directly to the monomer feed line and injection, and mixed with it in the in-line mixer. 공개시제는 전면 플랜지를 통한 보링(boring)을 통해 단량체 혼합물이 반응기에 유입되는 바로 그 지점에서 단량체 혼합물에 주입하였다. Published prototype was injected into the monomer mixture at the very point at which the monomer mixture is introduced into the reactor through a boring (boring) through the front flange. 전면 플랜지를 통한 제2 보링은 개시 구역의 반응 매스로의 직접 스트림 주입용 밸브를 수반한다. And through the front flange second boring it is disclosed involving the injection valve for the direct stream to the reaction mass in the zone. 상기 조성물에 따라 제조된 단량체 혼합물을 리드로 밀봉될 수 있는 150ℓ 들이 플라스틱 드럼 내로 가중시켰다. 150ℓ that can be sealed to the monomer mixture prepared according to the compositions as they lead was weighted into a plastic drum. 리드는 불활성-기체 침지 파이프용 개구, 배기 라인, 탈산소화 단량체 혼합물을 취하는 침지 파이프, 및 새로이 제조된 혼합물용 공급물를 갖는다. Lead is inert - has mulreul immersed pipe, and a freshly prepared mixture supplied for taking a gas immersion pipe opening, the exhaust line, deoxygenated monomer mixture. 이러한 설비는 충분한 탈산소화를 위해 질소 스트림을 갖는 기포탑으로서 작동되었다. The equipment was operated as a bubble column with a stream of nitrogen to a sufficient deoxygenation. 겔 샘플을 벨트 건조기에서 20분 동안 또는 가압 공기 오븐에서 2시간 동안 170℃에서 건조시켰다. The gel samples in forced air oven for 20 minutes or in a belt dryer for 2 hours and dried at 170 ℃. 무수 수분 흡수성 중합체 입자는 다음과 같이 열처리하였다. Dry water-absorbing polymer particles have been heat-treated as follows. 구역을 열풍 건으로 예열시켰다. It was pre-heated to a hot-air gun zone. 일단 목적 온도에 도달하여 안정화되면, 중합체 샘플을 구역 속에 넣고, 열전쌍을 샘플과 접촉시켰다. Once stabilized once reached the desired temperature, placed into the polymer sample in the zone, a thermocouple was brought into contact with the sample. 샘플의 온도가 목적 온도에서 안정화될 때까지 이를 모니터링하고, 샘플을 목적하는 시간 동안 목적하는 온도로 유지시켰다. Until the temperature of the sample is stabilized at the desired temperature monitor it, and was maintained at a desired temperature for the desired time the sample. 수분 흡수성 중합체 입자 200g을 밀봉 가능한 티백(63.5 x 76.2mm)에 넣고 0.9% 염수(염화나트륨) 속에 30분 동안 침지시킨 다음, 1400rpm에서 3분 동안 원심분리시켰다. It was put into the water-absorbing polymer particles 200g in a sealable tea bag (63.5 x 76.2mm), and soaked for 30 minutes in 0.9% saline (sodium chloride), and then centrifuged for 3 minutes at 1400rpm. 흡수된 염수의 중량에서 블랭크 용액(티백의 조직에 의해 흡수된 염수)의 중량을 뺀 중량 대 무수 수분 흡수성 중합체 입자의 초기 중량의 비를 측정하고, 원심분리된 흡수 용량(CC)로서 기록하였다. Measuring the ratio of the initial weight of the blank solution at a weight of absorbed saline (saline absorbed by the tissue of the tea bag), weight for dry water minus the weight of the water absorbent polymer particles, which was recorded as the centrifuged absorption capacity (CC). 나일론 스크린(50 x 50mm; 100메쉬)을 천공된 금속판의 상부에 놓은 후, 여과지에 이어서 최종적으로 내부 직경이 26mm이고 외부 직경이 37mm이며 높이가 50mm이고 말단이 둘 다 개방된 스테인레스 강 실린더 위에 놓았다. Nylon screen (50 x 50mm; 100 mesh) and then placed on top of perforated metal plate a, then a filter paper and finally an inner diameter of 26mm an external diameter of 37mm is placed on the height of 50mm, and a stainless steel cylinder of the terminal the two open . 수분 흡수성 중합체 입자 167mg 분획을 실린더 속에 넣고 균질하게 분포시켰다. Place the water-absorbing polymer particles in the cylinder 167mg fraction was homogeneously distributed. 직경이 26mm인 부직포 시트로 중합체를 덮고, 직경이 20mm이고 일정 중량을 수반하는 플라스틱 피스톤으로 내리 눌렀다. The covering of a polymer of a nonwoven fabric sheet having a diameter of 26mm, and pressed down with a plastic piston of 20mm diameter is accompanied by a constant weight. 피스톤의 총 중량과 피스톤상의 총 중량은 109.4g이며, 0.3psi 하중을 제공하였다. The total weight on the total weight of the piston and the piston is 109.4g, provided the 0.3psi load. 비례적으로 보다 무거운 중량이 피스톤 상에 놓여져, 0.6psi 및 0.9psi의 중량을 부여한다. The heavier weight proportionally placed on the piston, to give the weight of 0.6psi and 0.9psi. 상부에 실리더 속의 생성물을 갖는 금속판을 0.9% 염수 속에 침지시켜, 나일론 스크린과 용액 표면이 동일한 수위에 있어, 여과지와 수분 흡수성 중합체 입자가 유체 정력학적 압력 없이 유체를 흡수할 수 있도록 하였다. Immersing a metal plate with the product in the cylinder on top in 0.9% saline, and so that the nylon screen and the solution surface in the same level, the number of the filter paper and the water absorbing polymer particles to absorb the fluid without hydrostatic pressure. 입자는 1시간 동안 침지된다. Particles are immersed for one hour. 수 저장소로부터 판을 꺼내어, 금속판의 홀과 나일론 스크린 속의 과량의 액체를 종이 티슈로 흡수하였다. It is taken out of the plate from the reservoir, and absorb the excess liquid in the holes of the metal plate and the nylon screen with a paper tissue. 이어서, 팽창된 겔로부터 중량을 제하고, 겔을 칭량하였다. Then, the weight from the swelled gel, and the gel was weighed. 하중하에 흡수된 염수 중량과 수분 흡수성 중합체 입자 중량의 비는 하중하 흡수율(AUL)로서 기록하였다. The weight ratio of the salt and the water-absorbing polymer particles by weight of the absorption under a load was recorded as the water absorption under load (AUL). 수분 흡수성 중합체 입자 1g 분획과 0.9% 염수 185g을 캡핑되어 쉐이커 위에 16시간 동안 정치되어 있는 250ml 용기 속에 넣었다. Water-absorbent polymer particles were placed in a 250ml vessel 1g, which is capped with a fraction of 0.9% salt water 185g is allowed to stand for 16 hours on a shaker. 추출 용액의 일부를 여과하였다. A portion of the extraction solution was filtered. 메트롬 티트로프로세서(Metrohm Titroprocesser)의 조력하에, 소정 용량의 여과물의 pH를 0.1N NaOH에 의해 pH 10으로 조절하고 최종적으로 염산으로 pH 2.7로 적정하여, 여과물 중의 추출물의 양을 측정하였다. Under the assistance of Metrohm Teatro Processor (Metrohm Titroprocesser), by adjusting the pH of the filtrate to pH 10 with a predetermined capacity by 0.1N NaOH and finally titrated to pH 2.7 with hydrochloric acid, filtered, measuring the amount of the extract in water. 이로부터, 수분 흡수성 중합체 중의 추출물의 양을 계산하였다. From this, we calculated the amount of the extract of the water-absorbing polymer. 수분 흡수성 중합체 입자 1g 분획과 0.9% 염수 185g을 캡핑되어 쉐이커 위에 16시간 동안 정치되어 있는 250ml 용기 속에 넣었다. Water-absorbent polymer particles were placed in a 250ml vessel 1g, which is capped with a fraction of 0.9% salt water 185g is allowed to stand for 16 hours on a shaker. 추출 용액의 일부를 여과하고, 여과물의 샘플을 ODS 컬럼과 약 205nm에서의 자외선 검측을 사용하여 액체 크로마토그래프 내에 주입하였다. Filtering a portion of the extraction solution, the filtration of water samples using UV detection at 205nm and about ODS column was injected into the liquid chromatograph. 잔여 단량체는, 아크릴산 피크의 피크 면적 대 표준 샘플의 피크 면적을 비교함으로써 계산하였다. Residual monomer was calculated by comparing the peak area of ​​the peak areas for the standard sample of the acid peak. 단량체 혼합물을 조성 1A에 따라 제조하고, 상술한 플라스틱 드럼 속에 도입한 다음, 이를 질소로 퍼징함으로써 30분 이상 동안 탈산소화하였다. To prepare a monomer mixture according to the composition 1A, and introduced into the above-mentioned plastic drum, and then by purging it with nitrogen was deoxygenated for at least 30 minutes. 10% 수성 과황산나트륨 용액과 1% 아스코르브산 수용액을 별도의 2ℓ 컨테이너 속에서 제조하고, 이를 탈산소화시키고 공급 라인에 고정하였다. Preparation of a 10% aqueous sodium persulfate solution and 1% ascorbic acid aqueous solution in a separate container and 2ℓ, this digestion deoxidation and fixed on to the supply line. 모든 재킷 세그먼트의 온도와 교반기 시스템의 온도를 60℃로 설정하고, 시간당 500ℓ의 질소 스트림을 반응기로부터 취입하여 불활성 기체 대기를 유지시키고, 혼련 샤프트의 속도를 12rpm으로 설정하였다. Set the temperature to the temperature of the agitator system of any jacket segments to 60 ℃, and by blowing a stream of nitrogen per 500ℓ from the reactor and maintain an inert gas atmosphere, and set the speed of the kneading shaft to 12rpm. 반응기의 모든 세그먼트에 대한 열 교환 유체의 온도가 설정점 온도에 도달한 후, 단량체 혼합물 공급물을 개시하고, 공급 속도를 90kg/h(총 반응기 용적 1ℓ당 시간당 2.9kg)으로 설정하였다. After the temperature of the heat exchange fluid for all segments of the reactor reaches the set point temperature, starting the monomer mixture feed, and the feed rate was set to 90kg / h (total reactor volume per hour, 2.9kg per 1ℓ). 단량체 혼합물의 온도는 22℃였다. The temperature of the monomer mixture was 22 ℃. 개시제를 단량체 공급물과 함께 동시에 공급한다. And it supplies the initiator at the same time with the monomer feed. 과황산나트륨을 45.25g/h(아크릴산 기준으로 1350ppm)의 속도로 공급하고, 아스코르브산을 4.68g/h(아크릴산 기준으로 145ppm)의 속도로 공급하였다. Sodium persulfate was fed at a rate of 45.25g / h (based on the acrylic acid 1350ppm), and the supply of ascorbic acid at a rate of 4.68g / h (based on the acrylic acid 145ppm). 약 30분 후, 중합이 정상 상태에 도달하였다. After about 30 minutes, and the polymerization reaches a steady state. 이는 반응기 길이 방향으로 다음과 같이 비교적 일정한 온도 프로필을 나타내었다: T1(개시 구역) = 54±3℃, T2(겔 상) = 81±3℃, T3= 82℃. This reactor longitudinal exhibited a relatively uniform temperature profile, as follows: T1 (initiation zone) = 54 ± 3 ℃, T2 (gel phase) = 81 ± 3 ℃, T3 = 82 ℃. 생성물 온도는 생성물이 회수 컨테이너에 도입됨에 따라 약 100℃였다. The product temperature was about 100 ℃ as the product is introduced into the recovery container. 생성물 컨테이너는 단열되지 않으므로, 생성물은 비교적 신속하게 냉각될 수 있었다. The product container is not heat-insulated, and the product was subject to relatively rapid cooling. 이러한 중합 실험은 연속적으로 10시간 동안 수행하였다. The polymerization experiments were subsequently carried out for 10 hours. 겔 샘플은 투웨이 밸브의 제2 배출구에 고정된 플라스틱 호스 내로 겔 약 1kg을 장전함으로써 연속 공정이 수행되는 동안 취하였다. Gel samples were taken during the continuous process carried out by loading the gel about 1kg into the plastic hose fixed to the second outlet of two-way valves. 이어서, 겔 샘플을 호스의 원 말단으로 이송시키고, 호스를 샘플과 반응기 사이에서 열 밀봉하고, 샘플 함유 부분을 호스로부터 절단하였다. It was then transferred to the gel sample in a circular end of the hose, and a hose, heat-sealing, between the sample and the reactor, and cut the sample-containing portion from the hose. 불활성 기체 대기하에서 이와 같이 수득된 겔 샘플을 70℃에서 60분 동안 오븐 속에 넣어 단량체 전환을 종결시켰다. The sample gel thus obtained under an atmosphere of inert gas was terminated monomer conversion put in the oven for 60 minutes at 70 ℃. 이어서, 겔을 직경이 1 내지 5mm인 소정의 크기로 절단한 다음, 가압된 공기 오븐 속에서 170℃에서 2시간 동안 건조시켰다. Then, the gel was cut to a predetermined size with a diameter of 1 to 5mm, and then dried in a forced air oven for two hours at 170 ℃. 무수 중합체를 가정용 가전설비(Moulinette) 속에서 제분하고, 씨빙하였다. Milling the dry polymer in home electronics equipment (Moulinette) and seed was ice. 모든 분석 방법에서 30 내지 50메쉬 분획을 사용한다. It uses a 30 to 50 mesh fraction in all analysis methods. 이들 샘플을 평가하는 데이터는 표 1에 기록하였다. Data to evaluate these samples are reported in Table 1. 또한, 샘플 9개의 평균치가 제시되어 있다. In addition, a sample average value of 9 is shown. "RAA"는 잔여 아크릴산을 나타낸다. "RAA" represents the residue of acrylic acid. 분쇄하고 씨빙한 물질의 샘플을 또한 열처리하였다. Samples of the crushed and ssibing material was also heat treated. 이러한 열처리 동안, 중합체 입자는 고온 공기 스트림과 접촉하여, 생성물 샘플의 온도는 220℃의 온도에서 20분 동안 유지되었다. During this heat treatment, the polymer particles are in contact with high-temperature air stream, the temperature of the product sample was maintained at a temperature of 220 ℃ for 20 minutes. 샘플 평가로부터 수득한 데이터는 표 2에 기록한다. The data obtained from the evaluation sample is reported in Table 2. 이러한 실시예는, 주어진 조건하에, 연속 중합이 초흡수성 중합체를 제조하기 위해 신뢰성 있게 적용될 수 있음을 보여준다. This embodiment, shows that under the given conditions, a continuous polymerization can be applied reliably to manufacture the superabsorbent polymer. 당해 일련의 실시예에서, 공급 속도 변수의 영향을 연구하였다. In the art a series of embodiments, investigated the effects of a variable feed rate. 변수가 표 3에 지시된 바와 같이 변했다는 점을 제외하고는 실시예 1에서 기술한 바와 동일한 과정과 조성을 당해 실험에 적용하였다. Variable with the exception of points has changed as indicated in Table 3. The composition was applied to the experiment with the same procedure described in example 1. 수집한 샘플을 실시예 1에 기재된 바와 같이 가공하여 평가하였다. The collected sample was evaluated by processing as described in Example 1. 결과는 표 4에 모아 두었다. The results are shown in Table 4 were placed together. 실시예 2 내지 6은, 공급 속도가 120kg/h 이하(시간당 총 반응기 용적 1ℓ당 약 4kg 이하)로 적용될 수 있음을 나타낸다. Examples 2 to 6, it indicates that the feed rate can be applied to 120kg / h or less (total reactor volume of 1ℓ about 4kg or less per hour). 공급 속도가 증가함에 따라, 체류 시간이 감소하며, 따라서 생성물의 냉각이 감소된다. As the feed rate increases, the reduced residence time, and thus the cooling of the product is reduced. 이로 인해 추출물이 약간 증가하고 잔여 단량체 수치가 증가한 이유일 수 있는 피크 온도의 증가가 발생한다. This occurs extract increases the peak temperature can be increased slightly and the increase of why the residual monomers. 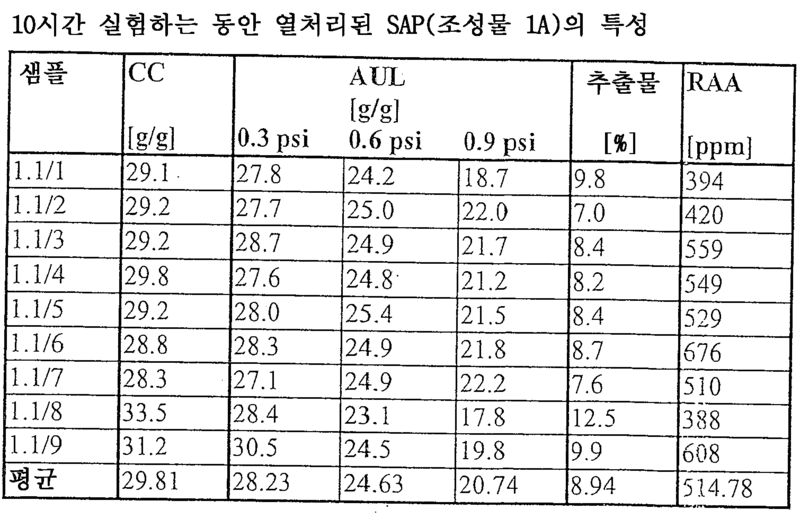 CC = 32.1g/g, AUL(0.3psi) = 21.2g/g, 추출물 8.6%, 잔여 아크릴산 = 603ppm. CC = 32.1g / g, AUL (0.3psi) = 21.2g / g, extract 8.6%, residual acrylic acid = 603ppm. 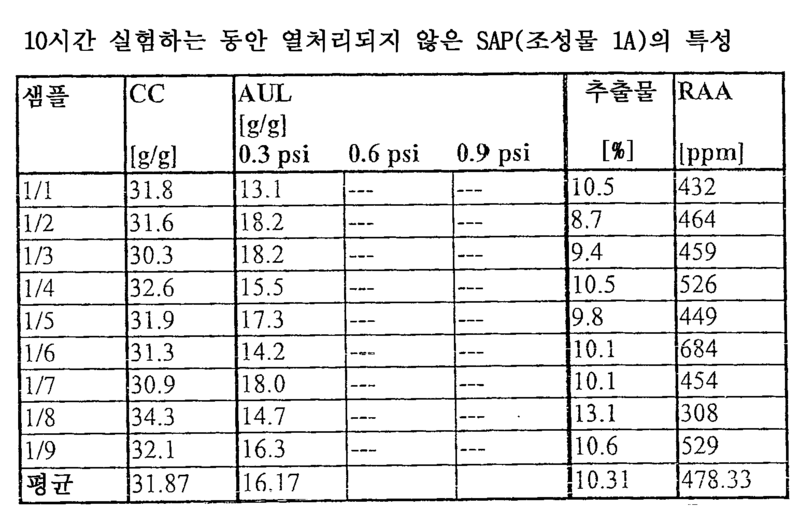 CC = 36.9g/g, AUL(0.3psi) = 12.0g/g, 추출물 9.7%, 잔여 아크릴산 = 458ppm. CC = 36.9g / g, AUL (0.3psi) = 12.0g / g, extract 9.7%, residual acrylic acid = 458ppm. 반응기에 2축 방출 컨베이어 대신 방출 말단에서 조절가능한 위어가 장착되어 있다는 점을 제외하고는, 실시예 7의 과정을 반복하였다. , Except that a twin-screw discharge conveyor instead of an adjustable weir at the discharge end to the reactor is fitted, and repeating the process of Example 7. 실험을 수행하는 동안, 위어(weir)를 반응기 방출 말단에 다음 정도로 인접하게 설치하였다: 위어 높이 0%, 즉 방출 개구는 완전히 개방됨; During the experiment, the weir (weir) was placed adjacent to the reactor so the next discharge end: the weir height of 0%, that being the discharge opening is completely open; 위어 높이 33%, 즉 방출 개구가 33% 폐쇄됨; Weir height 33 percent, that is, the discharge opening is 33 percent closed-search; 및 위어 높이 66%, 즉 방출 개구가 66% 폐쇄됨. And the weir height of 66%, that is, the discharge opening is 66 percent closed search. 겔 샘플을 반응기의 배출구에서 취한 다음, 추가의 가공 없이 입자 크기 분포를 측정하였다. The gel sample taken from the outlet of the reactor, followed by measuring the particle size distribution without further processing. 반응기로부터 방출되는 겔의 입자 크기 분포를 결정하기 위해, 겔 100g을 취하고, 겔의 총 중량을 기준으로 하여, 계면활성제 아틀라스 G 1425[아이씨아이 설팩턴츠(ICI Surfactants)로부터 입수할 수 있는 폴리옥시에틸렌 소르비톨 라놀린 유도체] 3000ppm과 조심스럽게 혼합하여, 과립화된 중합체 겔의 유동성을 개선시켰다. To determine the particle size distribution of the gel discharged from the reactor, and taking the gel 100g, based on the total weight of the gel, surfactant Atlas G 1425 [children C. I. seolpaek teoncheu (ICI Surfactants), polyoxyethylene, available from sorbitol lanolin derivative; carefully mixed and 3000ppm, and improved the fluidity of the granulated polymer gel. 이와 같이 처리된 겔을 레트쉬(Retsh) AS 200 씨빙 기계를 사용하여 표 6에 열거된 바와 같은 시이브로 조립된 씨빙 탑을 통해 체질한다. The process as this gel is sieved through a Shi-bromo-assembled ssibing tower as listed in Table 6 by using the LES teuswi (Retsh) AS 200 ssibing machine. 다음 조절이 선택되었다: 진폭 1mm, 영구 씨빙, 씨빙 시간 10분. The following controls were selected: amplitude 1mm, permanent ssibing, ssibing hours and 10 minutes. 분석 결과는 규격화된 스크린 상에 잔류된 전체 중의 겔 %의 형태로 표 6에 제시하였다. The results are presented in Table 6 in the form of gel% in the total residues in a normalized screen. 상기 결과는, 위어 높이가 증가함에 따라, 충전도가 증가함과 동시에 반응기 내부의 전단력도 증가함을 나타낸다. The result is, as the height of the weir increases, indicates that the filling degree is increased also with increased shear forces in the reaction vessel at the same time. 이로 인해 반응기로부터 방출되는 겔의 입자 크기가 감소된다. This decreases the particle size of the gel discharged from the reactor. 이러한 실험에서의 평균 입자 크기는 7 내지 12mm이었다. The average particle size in this experiment was 7 to 12mm. 반응기 속의 반응 매스의 온도 프로필에 영향을 주는 선택 사항을 연구하기 위해 실험을 수행하였다. Experiments were performed to study the options that affect the temperature profile of the reaction mass in the reactor. 조성물 1A를 사용하였다. The composition 1A was used. 반응기에 2축 방출 컨베이어가 장착되며, 교반기의 주 샤프트는 12rpm에서 작동하였다. And a twin-screw discharge conveyor mounted on the reactor, a main shaft of the agitator was operating at 12rpm. 반응기 가열/냉각을 중단하였다. The reactor was stopped a heating / cooling. 단량체 혼합물 공급 속도는 60kg/h으로 설정하고, 개시제 농도는 과황산나트륨 1350ppm(아크릴산을 기준으로 함)과 아스코르브산 145ppm(아크릴산을 기준으로 함)으로 설정하였다. The monomer mixture feed rate is set to 60kg / h and the initiator concentration was set to 1350ppm of sodium persulfate (hereinafter, based on the acrylic acid) and ascorbic acid 145ppm (hereinafter, based on the acrylic acid). 반응기를 다음 온도에 도달할 때까지 직접 증기 주입(2kg/h)으로 가열한다: T1 = 71℃, T2 = 62℃, T3 = 47℃. Heat the reactor to the direct steam injection (2kg / h) until it reaches the following temperatures: T1 = 71 ℃, T2 = 62 ℃, T3 = 47 ℃. 이어서, 증기 주입을 1kg/h로 감소시키고 이 수준을 전체 실험 수행 동안(이 시점으로부터 7시간 동안) 유지시켰다. Then, reduced the steam injected into 1kg / h was maintained (for 7 hours from this point) this level for performing the entire test. 반응기 압력을 약 600mbar로 조절하였다. The reactor pressure was adjusted to about 600mbar. 공급은 목적하는 속도보다 천천히 개시하고, 목적하는 공급 속도에 도달할 때까지 점진적으로 가속시켰다. Supply was gradually accelerated until the start slowly than the desired speed, and reaches the objective feed rate to. 20 내지 30분 후, 반응기가 정상 상태에 있으며, 온도는 다음 수분으로 일정하게 유지되었다: T1 = 60±3℃, T2 = 85℃, T3 = 82℃. After 20 to 30 minutes, the reactor is in an normal state, the temperature was maintained constant in the following water: T1 = 60 ± 3 ℃, T2 = 85 ℃, T3 = 82 ℃. 실시예 1과는 대비되게, 생성물은 반응기를 떠난 후 87℃였다. Example 1 and is presented, and the product was 87 ℃ after leaving the reactor compared. 반응기 배출구에서의 전환율은 94.8%이었다. Conversion in the reactor outlet was 94.8%. 반응기가 증기 가열되지 않은 점을 제외하고는 실시예 10A의 과정을 반복하였다. Except that the reactor is not heated steam it was repeated the procedure of Example 10A. 대신, 제1 세그먼트(개시 구역)는 60℃에서 재킷 가열하였다. Instead, the first segment (initiation zone) was heated at 60 ℃ jacket. 온도는, T1 = 62 ± 1℃, T2 = 84℃, T3 = 80℃에서 안정화되었다. The temperature was stabilized at T1 = 62 ± 1 ℃, T2 = 84 ℃, T3 = 80 ℃. 온도가 안정화된 후, 단량체 혼합물 중의 Fe +3 이온의 농도가 3ppm(아크릴산을 기준으로 함)이도록 하는 농도로 Fe 2 (SO 4 ) 3 를 과황산염 용액에 첨가하였다. After the temperature is stabilized, the concentration of Fe +3 ions in the monomer mixture was added to 3ppm (hereinafter on the basis of acrylic acid) such that a concentration of Fe 2 (SO 4) 3 in which the persulfate solution. 온도는, T1 = 65 ± 1℃, T2 = 84℃, T3 = 80℃에서 20 내지 30분 후 안정화되었다. The temperature was stabilized, T1 = 65 ± 1 ℃, T2 = 84 ℃, T3 = 80 in ℃ 20 to 30 minutes. 반응기 배출구에서의 전환율은 97.6%이다. Conversion in the reactor outlet is 97.6%. 실시예 10A의 초기 과정을 따르고 기본적으로 동일한 온도에 도달하였다. Following the initial procedure of Example 10A it was to arrive at the same temperature by default. 이어서, 철 이온 5ppm(아크릴산을 기준으로 한 양)을 개시제 시스템에 가하였다. Then, the iron ion 5ppm (amounts are based on the acrylic acid) was added to the initiator system. 이는 온도 변화를 유도하고, 다음 온도가 약 1시간 동안 기록되었다: T1 = 70 ± 1℃, T2 = 85℃, T3 = 82℃. This leads to a temperature change, the following temperatures were recorded for about one hour: T1 = 70 ± 1 ℃, T2 = 85 ℃, T3 = 82 ℃. 증기 공급을 중단하고, 세그먼트 1의 재킷을 77℃로 가열하였다. Stop the steam supply, and the mixture was heated to a jacket of the segment 1 to 77 ℃. 중합은 중단됨 없이 연속적으로 수행하고, 온도는 T3이 약 79℃로 강하되는 것을 제외하고는 변하지 않았다. The polymerization is carried out continuously without interrupted, and the temperature has not changed, except that the T3 is dropped to about 79 ℃. 반응기 배출구에서의 전환율은 98%이었다. Conversion in the reactor outlet was 98%. 실시예 10A 내지 10C의 결과는, 반응기 내부의 온도가 중합의 특정한 단계에 맞게 용이하게 조절 및 제어될 수 있음을 나타낸다. Example results of the 10A to 10C shows that the temperature in the reaction vessel can be easily adjusted and controlled to match the specific stage of the polymerization. 증기 주입 및/또는 금속 이온 첨가는 높은 초기 중합율에 요구되는 수준으로 개시 구역의 온도를 효율적으로 유지시킨다. Steam injection and / or water containing metal ions is thus efficiently maintaining the temperature of the starting section to a level required for a high initial polymerization rate. 이는, 재킷 가열이 목적하는 열 교환 수준을 제공하는 데 충분하지 않는 보다 큰 규모에 중요하다. This is more important than a large scale is not sufficient to provide the level of heat exchange jacket heating purposes. 감압하의 증발 냉각과 환류 응축 또한 피크 온도을 조절하는 데 효율적인 것으로 입증되었다. Under reduced pressure evaporative cooling and the reflux condenser it has also been proven to be effective in controlling the peak ondoeul. 생성물 온도는 87℃를 초과하지 않는다. The product temperature does not exceed 87 ℃. 단량체 혼합물을 조성물 2A에 따라 준비하고 60kg/h의 속도로 공급하는 점을 제외하고는 실시예 1의 과정을 반복하였다. , Except that a monomer mixture prepared according to the compositions 2A and supplied to the 60kg / h speed were repeated procedure of Example 1. 중합 실험을 개시하고 안정하고 일정한 조건에 도달할 때까지 지속시켰다. Initiating polymerization experiment, a stable and was continued until it reaches a constant condition. 이어서, 단량체 혼합물 공급을 표준 공급물로부터 산이 수산화나트륨 대신 수산화칼륨으로 중화된 점만 제외하고 이와 동일한 조성의 공급물로 전환시켰다. It was then acid a monomer mixture fed from the standard feed, except that the neutralization with potassium hydroxide instead of sodium hydroxide and converted to this the feed of the same composition. 칼륨 함유 혼합물을 30초 동안 공급한 다음, 당해 공급물을 표준 공급물로 다시 전환시켰다. A potassium-containing mixture is supplied for 30 seconds and then allowed to switch back to the art of water supply to a standard feed. 표준 공급물로 다시 전환시키는 시점은 체류 시간 0으로 정의한다. Time to switch back to the standard supply of water is defined as the residence time zero. 겔 샘플을 -2분으로부터 16분까지 매분 불활성 기체 대기하에 취한 다음, 2분 기준으로 30분까지 취하였다. The gel samples from 2 minutes to 16 minutes, taken every minute under an inert gas atmosphere in the following two minutes the reference was taken up to 30 minutes. 샘플의 상대 칼륨 농도를 X선 형광성에 의해 분석하여, 칼륨 형광성 세기를 측정하였다. The relative concentration of potassium in the sample and then analyzed by X-ray fluorescence to measure the fluorescent strength potassium. 이 값을 플롯팅하고 약 5분의 평균 체류 시간을 누적 플롯으로부터 수득하였다. Plotting the value which was obtained from the cumulative average residence time of about 5 minutes plot. 반응기의 방출 말단을 1.83° 이승시키는 것을 제외하고는 실시예 11의 방법을 반복하였다. The discharge end of the reactor was repeated the procedure of Example 11 except that 1.83 ° square. 평균 체류 시간을 약 6.2분으로 측정하였다. The average residence time was measured in about 6.2 minutes. 공급 속도가 90kg/h인 것을 제외하고는 실시예 11의 방법을 반복하였다. The feed rate was repeated the procedure of Example 11 except that 90kg / h. 평균 체류 시간이 약 4분으로 측정되었다. The average residence time was measured as about 4 minutes. 또한, 이러한 측정 결과는 공급물의 80%의 체류 시간이 조건에 따라 8 내지 12분 미만이고 공급물의 나머지 20%의 체류 시간이 이보다 김을 나타낸다. In addition, these measurement results show that steaming than 8 to less than 12 minutes residence time, and feed the rest of 20%, depending on the conditions the retention time of 80% of the water supply. 다음 4가지 실험은, 중합을 수행하는 동안 피크 온도 조절의 이점을 나타낸다. Four experiments, shows the advantages of peak temperature control during the polymerization. 반응기 내의 압력이 600mbar로 설정되고 단량체 혼합물이 60kg/h(시간당 반응기 용적 1ℓ당 1.93kg)의 공급 속도로 공급되는 조성물 2A인 점을 제외하고는 실시예 1의 과정을 반복하였다. The pressure in the reactor is set to 600mbar and with the exception of composition 2A of points supplied to the feed rate of the monomer mixture is 60kg / h (per reactor volume per 1ℓ 1.93kg) was repeated the procedure of Example 1. 증기 1.2kg을 신뢰성 있고 신속한 개시를 위해 개시 구역에 주입하였다. 1.2kg and reliable vapor was fed to the initiation zone for fast start. 반응 매스의 온도는 85℃를 초과하지 않았다. The temperature of the reaction mass did not exceed 85 ℃. 수집한 겔 샘플을 70℃에서 1시간 동안 유지시킨 다음, 추가로 가공하고 평가하였다. The collected gel sample was maintained at 70 ℃ for one hour and was further processed and evaluated as. 수득된 특성은 다음 표 7에 기록한다. The resulting properties are recorded in Table 7. 반응기를 대기압하에 유지시키고 공급 속도를 90kg/h(시간당 반응기 1ℓ당 2.9kg)으로 증가시키는 것을 제외하고는 실험 14를 반복하였다. The holding and feed rates to the reactor at atmospheric pressure was repeated and the experiment 14 except that the increased 90kg / h (per reactor per 1ℓ 2.9kg). 증기가 주입되지 않는다. Not steam is injected. 수득된 겔 샘플의 온도는 100℃이다. The temperature of the resultant gel samples is 100 ℃. 중합반응이 종결될 때까지 생성물 온도를 80℃ 이하로 유지시키기 위해 세그먼트 3의 재킷을 20℃(T3)로 냉각시킨 것을 제외하고는 실시예 3(공급 속도 60kg/h)을 반복한다. Except for the polymerization the cooling jacket of the segment 3 in order to maintain a product temperature below 80 ℃ until it is terminated with a 20 ℃ (T3), and repeats the Example 3 (a feed rate 60kg / h). 수집한 겔 샘플을 100℃에서 90분 동안 유지시킨 다음, 추가로 가공하였다. In which the gel was collected in a sample-and-hold 100 ℃ for 90 minutes, then processed further. 실시예 15를 반복하되, 공급 속도는 90kg/h이고 재킷 및 샤프트 온도는 모든 세그먼트에서 60℃였다. Embodiment, repeat Example 15, the feed rate was 90kg / h and jacket and shaft temperature was 60 ℃ in all segments. 이러한 설정으로 생성물 온도는 방출 말단에서 100℃로 상승하였다. In this setting the product temperature rose to 100 ℃ at the discharge end. 상기 표에서의 데이터는, 85℃ 이상의 피크 온도가 추출물 농도를 보다 높인다는 것을 나타낸다. Data in the table, more than 85 ℃ peak temperature indicates that more will increase the extract concentration. 온도 조절을 위해 실시예 14에서 진공이 적용되었다. The vacuum was applied in Example 14 for the temperature control. 실시예 15에서, 냉각은 재킷 냉각에 의해 충분히 이루어졌다. In Example 15, sufficient cooling was achieved by jacket cooling. 실시예 14 및 15와 비교 실시예 14A 및 15A의 결과를 비교해 보면, 중합이 수행되는 동안의 온도 조절이 중요한 것을 알 수 있다. In Examples 14 and 15 and Comparative Examples compare the results of Examples 14A and 15A, it can be seen that the temperature control during the polymerization is carried out is important. 중합 후 물질을 높은 온도로 유지시키면, 생성물을 불량하게 하는 효과가 크게 감소된다. When maintaining the polymeric material and then to a temperature, it is greatly reduced, the effect of the failure of the product. 대규모의 경우, 전도성 열 전달의 경우 수득되는 낮은 표면/용적 비로 인해 감압이 가장 바람직한 온도 조절 방법으로 선택될 것이다. For large, the pressure ratio because of low surface / volume is obtained when the conductive heat transfer will be selected as the desired temperature control method. 제1 구역에 공급되는 수분의 일부 또는 전부가 증기 형태일 수 있는, 수분 흡수성 수 불용성 중합체의 제조방법. In which some or all of the water supplied to the first zone can be a vapor form, method of producing a water-absorbent water-insoluble polymer. 제1항에 있어서, 단량체가 중화도가 50 내지 80몰%의 범위인 부분 중화 아크릴산을 25 내지 50중량% 포함하는, 수분 흡수성 수 불용성 중합체의 제조방법. The method of claim 1 wherein the monomer, method of producing a water-absorbent water-insoluble polymer to a degree of neutralization of partially neutralized acrylic acid contains a range of 50 to 80 mol%, 25 to 50% by weight. 제1항에 있어서, 개시 구역의 온도가 40 내지 85℃인, 수분 흡수성 수 불용성 중합체의 제조방법. The method of claim 1 wherein the temperature of the starting zone 40 to 85 ℃, method for producing a water-absorbent water-insoluble polymer. 제1항에 있어서, 감압시키고, 수분을 증발시키며, 응축물이 제3 구역으로 회수되도록 하는 환류 조건하에서 물을 응축시킴으로써 반응기의 피크 온도가 60 내지 85℃의 온도 범위로 유지되는, 수분 흡수성 수 불용성 중합체의 제조방법. The method of claim 1, wherein the reduced pressure, and evaporating the water, condensed water, the water-absorbing moisturizing maintained at a temperature range of the reflux water is the peak temperature of the reactor at 60 to 85 ℃ by condensation under conditions such that retrieval of third zone process for producing a water-insoluble polymer. 제1항에 있어서, 제3 구역에서의 평균 체류 시간의 합이 4 내지 80분인, 수분 흡수성 수 불용성 중합체의 제조방법. The method of claim 1, wherein the third zone average residence time is the sum of 4 to 80 minutes, method for producing a water-absorbent water-insoluble polymer in. 제3항에 있어서, 제1 구역으로의 총 에너지 유입량의 50 내지 90%가 중합 반응 열에 의해 공급되고, 10 내지 40%가 주입된 증기에 의해 공급되며, 0 내지 15%가 반응용기벽을 가열시킴으로써 공급되는, 수분 흡수성 수 불용성 중합체의 제조방법. The method of claim 3, wherein a is 50 to 90% of the total energy input in the first zone is supplied by heat polymerization, and supplied by a 10 to 40% by injecting steam, 0 to 15% is heated to the reaction vessel wall the method of producing a water-absorbent water-insoluble polymer which is supplied by. 제1항에 있어서, 반응기로부터 방출되는 중합체의 중량 평균 입자 크기가 0.2 내지 2mm인, 수분 흡수성 수 불용성 중합체의 제조방법. The method of claim 1 wherein the production of a weight-average particle size of the polymer exiting the reactor is water-absorbent, water-insoluble polymer from 0.2 to 2mm. 제1항에 있어서, 제1 구역에 대한 공급 속도가 시간당 반응기 용적 1ℓ당 1 내지 3.9kg인, 수분 흡수성 수 불용성 중합체의 제조방법. The method of claim 1, wherein in the feed rate of the first zone 1 to 3.9kg per 1ℓ per reactor volume, a method of producing water-absorbent water-insoluble polymer. 제1항에 있어서, 제1 구역에 대한 공급 속도가 시간당 반응기 용적 1ℓ당 2.0 내지 3.4kg인, 수분 흡수성 수 불용성 중합체의 제조방법. According to claim 1, wherein the feed rate of the first zone of 2.0 to 3.4kg per 1ℓ per reactor volume, a method of producing water-absorbent water-insoluble polymer. 제1항에 있어서, 제3 구역에서의 체류 시간의 합이 7 내지 20분인, 수분 흡수성 수 불용성 중합체의 제조방법. The method of claim 1, wherein the third sum of the residence time in zone 7 to 20 minutes The method of producing a water-absorbent water-insoluble polymer. 제1항에 있어서, 제3 구역이 하나의 반응기 용기에 함유되는, 수분 흡수성 수 불용성 중합체의 제조방법. The method of claim 1, wherein the third zone the method of producing a water-absorbent water-insoluble polymer to be contained in one reactor vessel. 제1항에 있어서, 적어도 제2 구역 및 제3 구역이 하나의 반응 용기에 함유되는, 수분 흡수성 수 불용성 중합체의 제조방법. The method of claim 1, wherein at least the second zone and the third zone a method of producing a water-absorbent water-insoluble polymer to be contained in a single reaction vessel. 제1항에 있어서, 제1 구역이 제2 구역 및 제3 구역과 분리된 별도의 용기에 내장되는, 수분 흡수성 수 불용성 중합체의 제조방법. The method of claim 1 wherein the first zone is method of producing a water-absorbent water-insoluble polymer to be incorporated in a separate container and separate the second zone and the third zone. 제1항에 있어서, 제1 구역에 대한 공급물 중의 단량체 농도가, 공급물의 중량을 기준으로 하여, 45중량% 이상인, 수분 흡수성 수 불용성 중합체의 제조방법. The method of claim 1, wherein the monomer concentration in the feed to the first zone, on the basis of the feed by weight, 45% by weight or more, a process for producing a water-absorbent water-insoluble polymer. 제1항에 있어서, 반응기 시스템에서 샤프트 중의 2개 이상이 중복되는 반경을 갖고 반대 방향으로 회전하는, 수분 흡수성 수 불용성 중합체의 제조방법. According to claim 1, having a radius of at least two of the shaft overlap in the reactor system, the method for producing a water-absorbent water-insoluble polymer, which rotates in the opposite direction. 제17항에 있어서, 2개 이상의 샤프트가 상이한 속도로 회전하는, 수분 흡수성 수 불용성 중합체의 제조방법. Of claim 17 wherein, method of producing a water-absorbent water-insoluble polymer which is rotated at a different speed to more than one shaft. 제1항에 있어서, 제1 구역에 대한 공급물이 단량체, 개시제 및 물의 용액을 포함함을 특징으로 하는, 수분 흡수성 수 불용성 중합체의 제조방법. According to claim 1, characterized in that the first feed comprises a monomer, initiator, and water solution to the first region, method for producing a water-absorbent water-insoluble polymer. 제1항에 있어서, 단량체가 아크릴산을 포함함을 특징으로 하는, 수분 흡수성 수 불용성 중합체의 제조방법. The method of claim 1, wherein the method of producing a water-absorbent water-insoluble polymer, characterized in that the monomer is acrylic acid. 제1항에 있어서, 중합체 미립자가 재활용됨을 특징으로 하는, 수분 흡수성 수 불용성 중합체의 제조방법. The method of claim 1, wherein the method of producing a water-absorbent water-insoluble polymer characterized in that polymer particles are recycled. DE3872978T2 (en) 1987-08-10 1993-06-09 Nippon Catalytic Chem Ind A process for producing water absorbing resin. CH691572A5 (en) 1997-01-15 2001-08-31 List Ag Leaders In High Viscos A process for the continuous production of a hydrophilic polymer. ES2217814T3 (en) 2004-11-01 Procedure for obtaining water-swellable hydrophilic polymers, the polymers and their use.